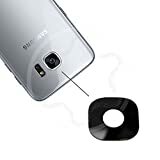 Replacement Camera Glass Lens for Samsung S7 Edge G935 Models. A replacement camera lens suitable for all Samsung Galaxy S7 Edge G935 models. It is VERY IMPORTANT to ensure that no glass shards or glass dust enters into the camera unit. Glass inside your camera will cause the camera to have focusing issues. This will then require a camera module replacement. Seek professional installation if you have any doubts. Whilst these phones are advertised as water proof (IP68), tests have shown that they are susceptible to water ingress. Once damaged they cannot be guaranteed waterproof and we do not recommend any submersion of the phone under water. Samsung do not cover any water damage under warranty. This entry was posted in Discount Photography and tagged Camera, Edge, G935, G935F, Galaxy, Glass, Komponentz, lens, Real, Rear, Replacement, Samsung by Ball Photo. Bookmark the permalink.